A country of symbolic colours, mesmerising diversity, ancient cities and old age mystery. Time seems to stop in awe as if watching the scenes of the silent 1913 Raja Harishchandra film. The quintessential lands of Maharaj, mysteries of the Maghal empire, magical allure of the Taj Mahal, the world famous Golden Triangle and last but not least, step in the boots of Indiana Jones and lose yourself in the narrow streets of Kathmandu. Truly quintessential India, surely worth a big tick on your bucket list. This vast glorious country, blessed with diverse culture and idyllic beautiful landscapes, cannot be covered in a single trip, so what follows is a list of my favourite sights that this grand country has to offer so you can plan your perfect trip to India. Land of the Kings, home to the valiant Rajputs, Jaipur, Rajasthan’s capital, is the gateway to India’s most celebrated state. 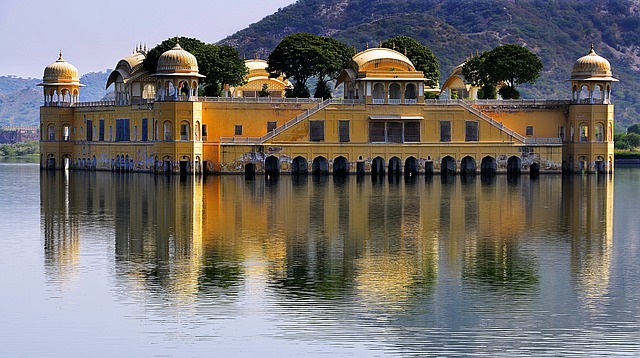 This area is littered with opulent castles and forts most of which are now exclusive hotels, restaurants and impressive museums, these include Jaisalmer Outpost, Amber Palace and Jodhpur’s majestic Mehrangarh to name just a few. A kaleidoscope of colour lights up Rajastan, from the bright intensity of the hues of the turbans and saris worn in Jaipur, the ever bright Rajasthan festivals , decorated camels in Pushkar, brightly painted elephants in Jaipur, to the rainbow spectrum the of Diwali and Holi, celebrated across the state in October and March respectively. Jaipur will truly light up your soul. The centre of India’s great Mughal empire, and its legacy lives on in beautiful artwork, mouth-watering cuisine and magnificent architecture. But Agra is more than a one-sight town. The remnants of the Mughal empire include; the magnificent fort and an array of fascinating tombs and mausoleums. Deemed a love poem composed of stone, The Taj Mahal is breath taking with its arched entryway, it certainly leaves you breathless with awe and deserves to be hailed as one of the most beautiful buildings on the planet. Alongside the enchanting Agra Fort and the rolling palace complex of Fatehpur Sikri, the trio are a must-do during your trip to India. Immense yourself in Mughlai cuisine, whose origins can be traced back to Medieval India and the Mughal Empire. The food is spicy and has a very unique aroma and taste. Foodies will happily lose themselves in a bowl of biryani, pulao and kofta. Dubbed Eight cities in one, transcending the corridors of history, Delhi has it all, a century-old Muslim settlement to the leafy, British-built districts of New Delhi, planned in the 20th century. Packed with historical treasures and architectural marvels to the new age city, crowded, with chaotic streets filled with rickshaw drivers, sacred cows and aromatic street side food stalls. Goa’s golden, tropical beaches and Portuguese culture makes it a unique and beautiful travel destination. Every beach community is unique and there is accommodation to cater for all from backpackers to luxury five-star resorts. India’s smallest state, Goa stands out from other Indian destinations for it’s Portuguese roots. Explore Portuguese colonial architecture, wander through rice paddies or relax on one of the many stunning beaches. Many travellers are drawn to Goa for spiritual exploration. Enjoy a sunrise yoga session, or reiki healing course and truly relax on your trip to India. Enchanting, intriguing, and therapeutic are some of the few words l can use to describe this expansive piece of earthly beauty but no words can define the adventure of travelling to India.